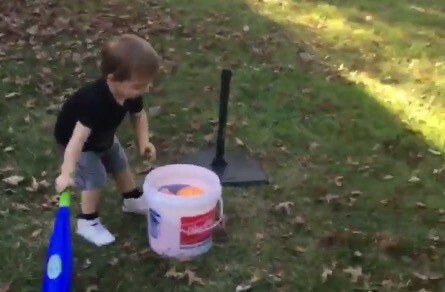 I was about to chalk this kid’s placement of a basketball atop a tee ball tee up to some toddler confusion, but it turns out the kid knew EXACTLY what he was doing. Squaring up the ball just so, this little moppet takes a champion’s cut and…swish. If you’ve never seen a person sink a three-pointer with a baseball bat on a grass lawn, you’re going to want to check this out. Nice work, Calvin. You’ve got a bright future, kiddo.